I have worried, how do I explain what was clearly God’s leading to me? I did not want it to sound like I wanted a “Mrs.” degree, harkening back to the goal of many women in the 1950s, you know, go to college to find a husband…I didn’t want them (or anyone else) to conclude, “Why even get educated”? I explained to them that I wasn’t boy crazy and I wasn’t trying to make marriage the goal of life for anyone, but I do think that I had a very real calling to work in this field, on many levels, and infuse marriage and family ministries with a completely different spiritual dimension. Human marriage points to the marriage that is the ultimate goal of life: marriage to Christ. As it turns out, I’m about to embark on a glamorous high-profile career of…wait for it – working for my church for a thousand a month? I am just trusting God on this one…and I am happy and thankful to report that my parents “get it” and are pleased with my desire to hear and respond to God’s call on me. In working in the family and marriage ministry, I have realized in some cases, we are going about reaching people all wrong! Yes, we need educated people, who specialize in cultural and family issues in the pro-family movement. More importantly, we need innovators, people like my pastor at church, who are passionate and excited to try something new. What is accomplished when two sides of thought and culture are angrily screaming into the wind at each other? Angry Noise without a whisper of respect. That is all it will ever be. We need to stop throwing hatred at the culture war, not even to throw writings and pamphlets and ideas (although there is a place for that), but to acknowledge that Christianity is actually losing the culture war and it/we need some fresh methodologies to enhance the fight, without throwing the proverbial baby out with the bath water. Now, you may expect that I will launch into a new evangelical ballad on staying out of politics, or a Young-Life strategy that relational evangelism is the only best method and the only thing we should be doing in this world. That is so very wrong. Politics is actually a remarkable tool God has given us to help us end institutional sin and injustice to people! I’m sick of this “change the hearts not the law” talk, when they were never meant to go against one another. Not ever. If there ever was a perfect example of institutional sin and injustice, it was the lack of Civil rights for people based on the color of their skin… the Civil Rights laws that were implemented helped change the hearts, minds and FUTURE of a lagging nation. (there have been other examples since). But as I alluded to earlier, such culture war reform doesn’t mean we abandon the war, we just need to regroup, get a couple new generals and some new ideas. Far from abandoning political action, I still get mad when my mentors have told me I better not have political signs in the yard, or have a bumper sticker. Oh but what does that bumper sticker say? Isn’t there a difference between “Abortion is One Dead, One Wounded,” which make people think in new ways, or “Help After Abortion call 1888 …” and inflammatory ones “Abortion: infant genocide” (again, true, but not helpful!). Sometimes it is a tough line to draw, admittedly. Here’s one way I’ve begun to figure this all out, for these sides of me are another of the mysterious Christian paradoxes that make our life so rich. When we protest at a Charlottesville abortion clinic, we used to bring signs. These turned women off to us. What we had written was TRUE, and sometimes the truth hurts. But this was truth without love. This was justice without mercy. I read a sidewalk counseling guide that made stuff clear to me: protests are valid! But not while sidewalk counseling! Duh! There is a time for every purpose under heaven. And right when a baby’s life and a mother’s heart is on the line, it didn’t matter that our signs were true. It mattered that the message wasn’t working. You can probably sense in my writing that I still wrestle with the balance and the wisdom of all of this. Of course King David did too, as he proclaims his utter pure hatred for his enemies, but then asks God to purify Him if there is any offensive way in Him (Psalm 139). Being honest with God in prayer is the logical start to all of this! Sometimes it’s only through making mistakes that I’ve learned important lessons like Listening and Loving, understanding that when people don’t have God-what they are doing is rational to them even though it is destroying them, and that I am just as much in need of God’s grace as they are. I have to ask myself, where would I be if He hadn’t revealed Himself to me? How can I judge the person who does not believe in Jesus Christ? No, rather we must judge the church! How can the Church be better? So where does that leave me now? Still on this journey towards figuring it all out. I don’t have all the answers. But I’m beginning to know this: one doesn’t have to sacrifice depth to evangelize, inreach for outreach, or zealousness for gentleness. All of these things, like the heart and the law, are actually friends. I cling to this: Jesus loves me. He made me as I am. He knows my weaknesses and strengths! He sanctifies. 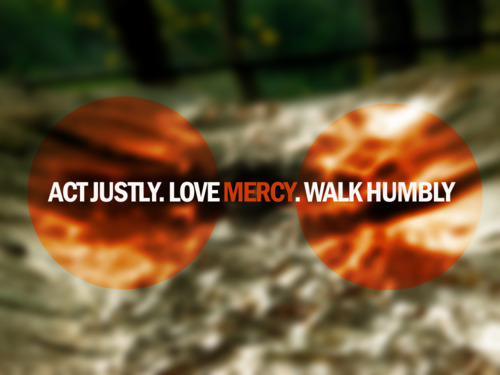 And thus Micah‘s ever quoted words of mercy and justice end with this: and WALK HUMBLY with your God. LIKE IT? Pass it on! setyourpathsstraight on What will I do? Kathy Klisch on What will I do? Kyle Blevins on What will I do?